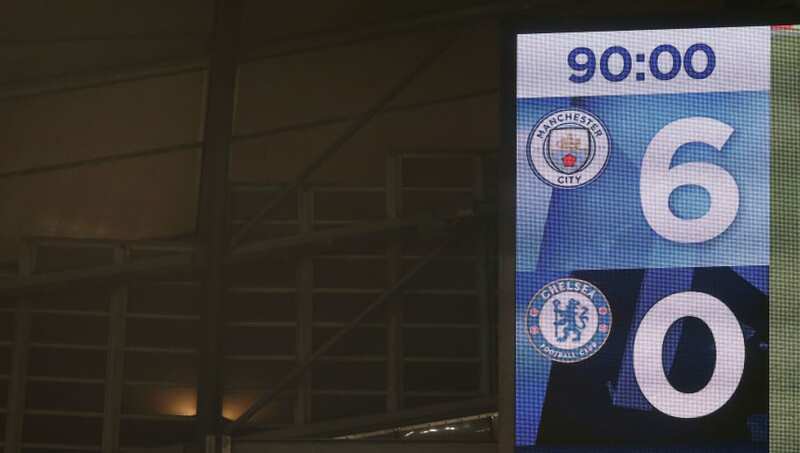 Manchester City officials apologised to Chelsea on Sunday afternoon​ after appearing to taunt the Blues by playing 'One Step Beyond' by Madness, following the Citizens' 6-0 win at the Etihad Stadium. Chelsea firstly suffered a humiliation on the pitch, as the hosts reduced them to a laughing stock with a sensational display of fast, attacking football. Raheem Sterling gave his side the lead after just four minutes, and a quick-fire double from Sergio Agüero, followed by İlkay Gündoğan's drive made it 4-0 with just 25 minutes on the clock. The Blues weathered the storm for a while, but Agüero's penalty saw him earn a hat-trick early in the second half, before Sterling's late tap-in completed the 6-0 hammering. Seemingly rubbing salt in the wound, the hosts, as reported by the Evening Standard, proceeded to play the Blues' traditional celebration song at the final whistle, very much to the delight of the home support. Perhaps understandably, the Chelsea fans were less than impressed, and City officials ordered the song to be cut short, before apologising to the visitors. City's win saw them surge back to the top of the ​Premier League table, where they are now ahead of ​Liverpool on goal difference. However, the Reds still have a game in hand, as do ​Tottenham Hotspur, who are just five points behind the leading pair. With tricky tests still to come for all three sides, the title race is starting to look like it could go down to the wire. Chelsea's aim of securing Champions League qualification via a top four finish is now looking unlikely, as the side have a brutal run-in of fixtures left, including trips to Old Trafford and Anfield. However, Maurizio Sarri's side are still in the Europa League, and winning the competition would afford them a precious place in next season's Champions League. Meanwhile, ​Chelsea boss Maurizio Sarri claimed he wasn't worried about his job being at risk following the heavy defeat. The former ​Napoli manager also pledged to stick to his 'Sarriball' philosophy, and lamented his side's recent struggles playing away from home. The Blues will look to bounce back on Thursday, when they take on Malmö in the Europa League.